Junior's trumpet helps corps win bronze award Yuri Arsenault is featured in the "School Notes" section of the Newburyport, Mass. 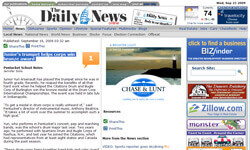 Daily News for his accomplishments as a bronze medal-winning corps member of the Citations. Arsenault, who plays the trumpet, outside of his drum corps experience participates in his high school's concert, pep and marching bands. Read more at NeburyportNews.com. Brick Marching Dragons prepare twins for national tour Twins Deven and Doug Scelfo were featured in a recent article on APP.com highlighting their participation this summer with the Jersey Surf. Seniors in high school, the two serve participate as members of the Brick, N.J. Marching Dragons. Read the article on APP.com. 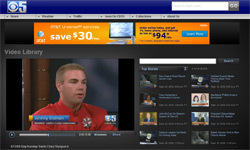 A Lexington percussionist's experience with Carolina Crown Carolina Crown percussionist Evan Worrell is featured in a recent article on Examiner.com for his participation in the 2009 DCI Tour. A junior in college, Worrell is working toward a degree in sports management. Read the article on Examiner.com. Troopers announce audition camps The Troopers are featured in the Casper, Wyo. 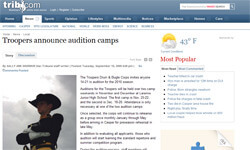 Star-Tribune for their upcoming audition camp dates in November and December. "We guarantee you will leave the camp with a full sense of what the Troopers are about, and take with you a weekend full of quality music instruction, great experiences, and new friends," Troopers development director Jamie Purcell said in the article. Read more at Trib.com.